Miami Trace Superintendent David Lewis (left) presents school board member Mike Henry with a plaque for his service as board president in 2018. At Monday’s meeting, Charlie Andrews (middle) was elected as president of the Miami Trace Board of Education for 2019. Bruce Kirkpatrick (second from left) was elected as vice president. Mike Henry (far left) was honored for his service as president in 2018. Also on the school board are Rob Dawson (far right) and David Miller (second from right). 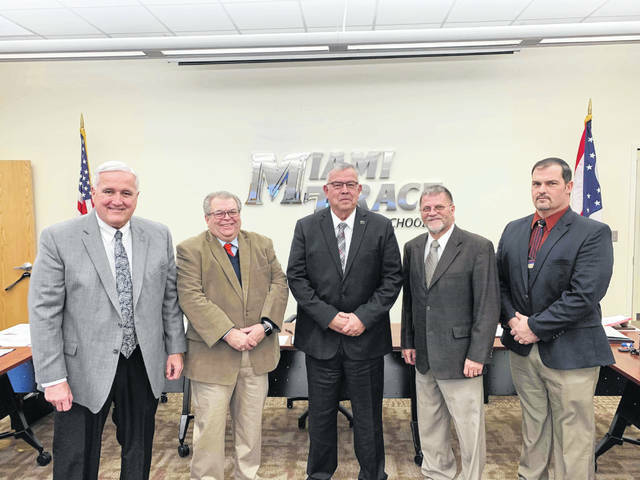 Charlie Andrews was unanimously elected by his board colleagues as the Miami Trace Board of Education president for 2019 at Monday’s meeting at the district’s central office. 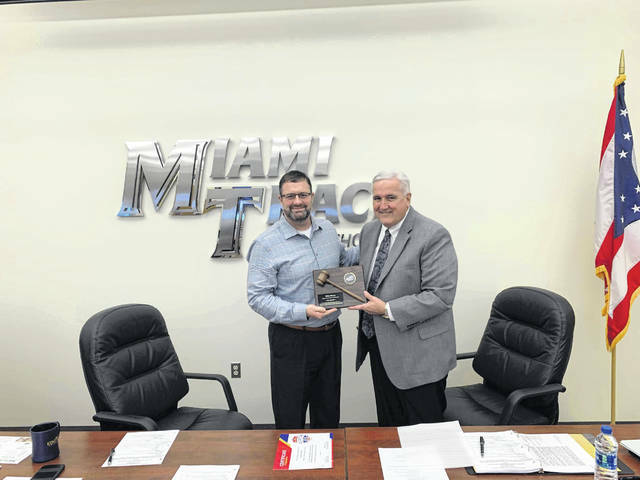 The president of the board for the 2018 calendar year, Mike Henry, was also recognized as Miami Trace Superintendent David Lewis presented him with a plaque. Bruce Kirkpatrick was unanimously elected as the vice president for this year. Andrews also spoke about the new high school project, which despite some challenges, is still on track for a dedication and open house on Sunday, Jan. 27. The board decided Monday that the open house will be held in the new high school’s gymnasium, rather than the auditorium, in order to accommodate a large crowd. The dedication will begin at 2 p.m., and the community is also invited to join the staff from 3-5 p.m. for an open house and building tours. All guests should use the event entrance to enter the building, and it will be completely opened for everyone to fully explore. The first day in session for students is scheduled for Feb. 20. Student orientations and tours will precede this date. Also at Monday’s meeting, the board established a service fund at $2 per pupil. “Right now, we have 2,596 students enrolled, so that would be a total of $5,192 dollars,” said school district treasurer Debbie Black. The board approved the December financial reports, which Black presented during the meeting. The board also approved a request from district business manager Bill Franke to seek bids for buses. The request is for one handicap bus and two 77-passenger conventional buses. The estimated cost for those three buses is around $290,000, according to Franke. The next regular Miami Trace school board meeting is scheduled for Jan. 28 at 5:30 p.m. at the board office. https://www.recordherald.com/wp-content/uploads/sites/27/2019/01/web1_received_490035464733492.jpegMiami Trace Superintendent David Lewis (left) presents school board member Mike Henry with a plaque for his service as board president in 2018.
https://www.recordherald.com/wp-content/uploads/sites/27/2019/01/web1_received_829909210734575.jpegAt Monday’s meeting, Charlie Andrews (middle) was elected as president of the Miami Trace Board of Education for 2019. Bruce Kirkpatrick (second from left) was elected as vice president. Mike Henry (far left) was honored for his service as president in 2018. Also on the school board are Rob Dawson (far right) and David Miller (second from right).